The once splendid solar photovoltaic industry in Nanjing was impacted by the domestic and international macroeconomic situation in the past 2012. It has entered the â€œIce Valleyâ€ and the annual main business revenue has dropped by 39% year-on-year. A year has declined by nearly 40%. This is not only the fierce status of the Nanjing PV industry, but also the PV industry in the province is facing the same dilemma. However, in the new year, especially in the most recent period, PV module prices have stopped continuation of the one- or two-year downtrend, and even there has been a slight rebound. Does this mean that the photovoltaic industry's winter is coming to an end? Two years ago, the annual growth of photovoltaic industry in Nanjing exceeded 100%. 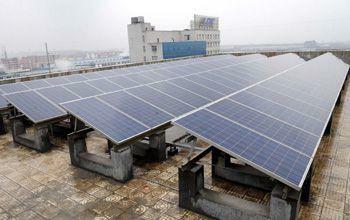 2010 was the most prosperous period for the development of the photovoltaic industry in Nanjing. â€œAt that time, the annual growth rate of sales revenue of the photovoltaic industry in the city had exceeded 100%.â€ Industry insiders, especially in the photovoltaic industry, have a barrier to entry, and they will soon be able to form production capacity by purchasing only one production line in some parts of the industry chain. . When the efficiency is best, some companies can recover tens of millions of investment costs within three months. Capital is too fast and densely aggregated in the same industry sector, which inevitably leads to serious overcapacity and disorderly industry competition. Coupled with the external influence of the â€œdouble reverseâ€ (anti-dumping, countervailing) of China's photovoltaic industry from the beginning of 2011, the national photovoltaic industry collectively entered the â€œwinter seasonâ€, and the performance of Nanjing photovoltaic companies began to decline significantly. More than 50 companies have been struggling for more than a year, and only a few dilemmas that remain the most profitable are the price of significant diving. Relevant statistics show that the price of PV modules has dropped from an average of US$1.51 per watt in April 2011 to US$0.66 in November last year, a drop of more than 56%, which has directly led to a sharp drop in business revenue. According to the person in charge of the relevant departments of the Municipal Economic and Credit Commission, there are currently more than 50 photovoltaic companies in Nanjing. After struggling for more than one year, no one has yet completely shut down or closed down. However, the status quo of survival has been difficult. Last year, only a few companies still There is a meager profit. The export data of the photovoltaic industry is also declining. In 2010, 98% of PV products in our city were reduced to 90% in 2011 and even less last year, and the export ratio was only about 70%. More and more photovoltaic companies are turning to the domestic market, which will inevitably intensify price reduction promotions, resulting in further shrinking profit margins. According to statistics, only from January to October last year, the photovoltaic industry in Jiangsu Province achieved an output value of approximately 180 billion yuan, a year-on-year decrease of 28%, and exports of US$6.89 billion, a year-on-year decrease of 38%. At the most difficult time, almost half of the nearly 1,000 PV manufacturing companies in the province were shut down, and large enterprises were also underemployed. According to relevant personage analysis, after the PV industry has experienced the â€œdifficult periodâ€ over a year earlier, it has already shown obvious characteristics of adjustment and integration period. During this period, the first priority was to strengthen the top-level design, further increase the industrial barriers, optimize the layout, strictly control the new photovoltaic projects that simply increase production capacity, and determined to eliminate a group of backward production capacity. â€œThe reason why the vast majority of PV companies in Nanjing can be temporarily safe in 'Winter' is that some core companies have their own core technologies in the relevant aspects of the industry chain, and they want to seize the commanding heights of the orderly development of the industry in the next round of competition. Enterprises should also seek further technological advancement.â€ Relevant people also suggest that the concept of market consumption also needs further guidance. In the context that coal-fired power generation poses significant risks for air pollution, it promotes distributed photovoltaic power generation and encourages the construction of rooftop power plants. Once this emerging market is opened, it will simultaneously play a dual role in promoting industrial development and reducing air pollution. The reporter learned that under the severe industrial background, the number of photovoltaic companies in our city has actually increased in the past year. According to the person in charge of the relevant department, the newly added companies are specialized in solar photovoltaic power generation projects, not photovoltaic manufacturers, and they are aiming for a higher-end new energy market. 7) Opening degree: 110 degree, 180 degree. 14) Suitable: apartments, office buildings, hospital etc as fire proof door. If you are interested in any model, please feel free to contact us for more details.